Shane Filan and Fazura to perform at the first lakeside concert at the City of Elmina! CITY OF ELMINA Brought to you exclusively by Sime Darby Property and organised by Universal Music Malaysia, the first lakeside concert at the City of Elmina – “Elmina Lakeside Concert” -- will take place on 19 January 2019 at the Elmina Central Park, located within the award-winning City of Elmina township in Shah Alam, the developer announced in a press conference today. The free admission concert, which is open to all, is a grand welcoming to all City of Elmina residents and an extension of the City of Elmina’s township brand campaign that promotes wellness and exceptional lifestyle in the most significant development along the Guthrie Corridor. The Elmina Lakeside Concert is brought to you exclusively by Sime Darby Property, organised by Universal Music Malaysia, with MIX and MY as Official Media Partners. Find your way to the concert by searching “Elmina Central Park, Shah Alam” on Waze or Google Maps. FREE tickets to the concert can be redeemed at www.simedarbyproperty.com/elmina-concert (terms and conditions apply). Fazura started her career as an actress and TV personality before including music in her portfolio, which led her to release her debut album last year that was certified gold. The event will begin at 5.30pm with a myriad of games and activities tailored for families, such as hot air balloon, fire-eater show, 12D Cinema, inflatable obstacle course, and food trucks, before the concert starts at 8pm. 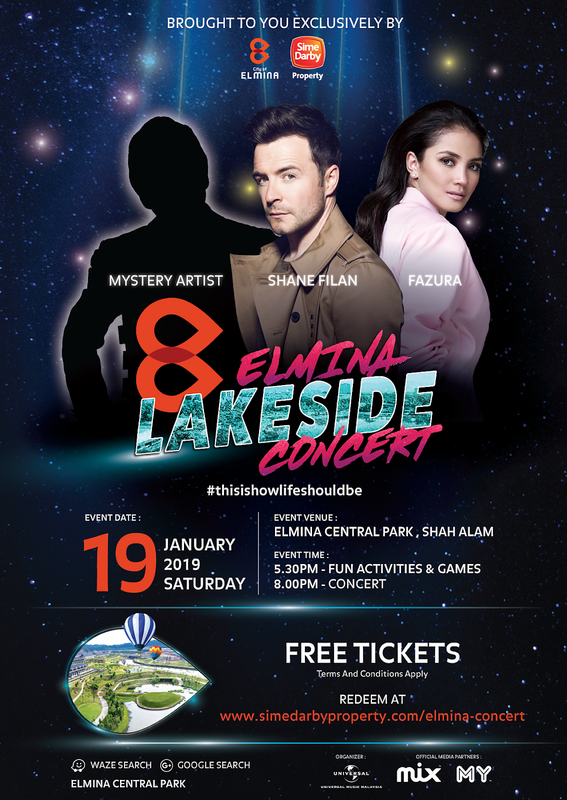 Concert-goers will be entertained by Shane Filan, one of the lead singers and frontman of Irish boy band Westlife; and Fazura, well-known Malaysian songstress and celebrity. A third act is confirmed to join the concert’s line up, which will be announced by the concert organisers at an appropriate time. Shane Filan, who rose to fame with Westlife and continued his music journey as a solo artiste when the group disbanded, is expected to perform classic hits of Westlife and new materials from his latest album.